Despite what everyone is all of a sudden worried about in the medical news, Teen Texting Tendonitis is NOT a 'disease that is quickly spreading'. Swine flu is communicable and spreadable. Physical ailments from repetitive motions and 'Teen Texting' is not. Tendonitis does not 'spread'. You either perform repetitive motion and your body responds accordingly, or you don't. It's really not a mystery, or a surprise, or a dangerous threat from above. Just like Cell Phone Elbow has hit the news and the internet in the last few months, welcome 'Teen Texting Tendonitis' to the scene. Teens, texting on their cell pones, getting Tendonitis. It kind of has a ring to it, don't you think. Ring tone?? So if you’re all of a sudden concerned about your teen, or if you are a person that spends a certain amount of time texting on your cell phone and are now experiencing symptoms, you might as well learn what is going on and what the ramifications are. Teen Texting Tendonitis is the name for the newest health alert by the medical news media. What is Teen Texting Tendonitis, exactly? Partly, it is a Tendonitis dynamic caused by the repeated pressing of buttons from texting on a cell phone. 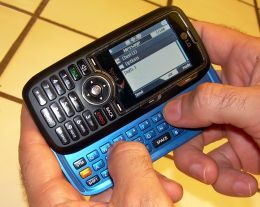 Partly, it is irritation of the finger and thumb joints, depending on how a person texts. This physical dynamic is not restricted to teens. Anybody that texts excessively can get tendonitis and ‘jointitis’. You get Tendonitis from texting on a cell phone the same way you get Tendonitis any other way. Repetitive motions, performed (obviously) over and over on the same activity, sets off a chain of physical events that lead to pain and problem. The lower arm and wrist and fingers have to hold and support, and muscles start to not like that after a while. The thumb does all the work, moving and pressing. And after a while those structures get disgruntled too. So called ‘Teen Texting Tendonitis’ has the same Tendonitis Symptoms other types of Tendonitis display, with slight variation for the specifics of the location and action of the body parts used. 1. Muscles fire over and over. 2. Every time a muscle contracts, it retains a tiny bit of that contraction, thus muscles slowly get tighter and tighter. 3. Tight muscles put more constant tension on the tendons. 4. Repetitive motion moves these too tight structures against other structures repeatedly. 8. More tightness, more pain. Did You Say Teen Texting Causes Joint Pain Too? Typing doesn’t cause a lot of joint pain, because the fingers don’t have to press very hard on today’s keyboards. That’s why pain usually shows up in the wrist and forearms and thumb pad muscles. Texting on a cell phone, however, uses different pressure. The thumb especially is pressing down with force on the buttons. Since thumbs are the primary digits used to press the cell phone keys, they take most of the brunt. Imagine leaning against a wall for hours and hours with nothing but your thumb. Like, you make a fist, stick your thumb out, and lean against a wall. After a while, this would obviously get uncomfortable. But your thumb joints would get irritated from all the pressure. Same with texting with one’s thumbs. Hundreds and thousands of times they are -pressing- down onto the cell phone. It adds up.Every day, the thumb gets a little bit irritated. Then as time passes, it gets more irritated because it was already irritated. The joint itself gets irritated and inflamed, from the bones pressing on each other. This results in an achey, arthritis feel. Inflammation settles into the joints. This is no good for kids or adults. So not only are your kids getting Tendonitis, they are potentially getting joint inflammation too. Add to that a diet of processed foods, refined wheat flour (inflammatory) and sugar (inflammatory), and we wonder why our kids aren’t holding up as well as we think they should. The good news, this is not a permanent condition...if they significantly drop the amount of time they spend on their phones.If they do continue to text a lot, exactly as they have been, it’s going to get worse. That’s just the way the body works. So What Do You Do To Stop Teen Texting Tendonitis? The only way to stop the growing 'scourge' of Teen Texting Tendonitis is to have your teen stop texting. And of course kids are smart enough to stop, and they still think they’re immortal, and it seems like they are committed to doing anything that you don’t want them to do (i.e. do smart things like stop doing an activity that hurts them). Still, stopping or limiting the amount of time spent texting is the foremost option. Or, you can get them a different phone, such that the motions they have to perform to text are drastically different than the ones they have been doing. The body likes variety. When it gets the exact same motion, that’s when Tendonitis starts to show up. There are other things to do, like increase a teens nutrition, take natural anti-inflammatories like Turmeric and Omega-3’s, Icing, exercise, stretching etc. And that will help if they actually do it. The Carpal Tunnel Treatment That Works is an immediate option to get out of pain and problem and keep it away. But ultimately, if they keep performing the same actions they will continue to get the same results. Surely there’s a life lesson in there somewhere. Return to the top of this Teen Texting Tendonitis page.